Detached holiday home with 2 Master En-Suite bedrooms and 3 further twin rooms. Beautiful, secluded and private lakeside holiday home with south facing patio, heated (optional) swimming pool and spa providing dawn to dusk sunshine. Ample high quality comfortable patio furniture. The property backs on to a scenic Lake that offers both privacy and peace. How many holiday villas have you seen which are overlooked? Ours is not overlooked! A perfect location to form the base for your holiday. Free high speed wireless internet. Two king sized master bedrooms with Egyptian Cotton bed linen and double en-suite bathrooms. One opens to the pool area, the other has a private balcony overlooking the pool, lake and surrounding countryside. The en-suites have ‘his & hers’ wash hand basins and walk-in wardrobes in addition to WC, large bath and shower. Both ensuite bedrooms have cable TV. Three further twin bedrooms with chests of drawers and cupboards. Two of the twins are themed, one is Disney Princess and the other Pirates of the Caribbean both have cable TV & DVD. All twin rooms have fully size twin beds with the Pincess room having special Disney Pillowtop mattresses. Two further full bathrooms, one with shower and one with bath and shower. Fully air-conditioned accommodation with additional, variable speed ceiling fans. For your safety we have fitted burgler alarms. Extremely comfortable lounge with reclining leather sofas and Tommy Bahama furniture. Dining and sitting rooms. A dream, open plan American Kitchen with all the appliances you could wish for, including a fantastic fridge freezer that provides constant ice, and cold filtered drinking water. Additional dining table in the breakfast nook overlooking the pool area. Utility room with, extra large state of the art High Efficiency steam washing machine and High Efficiency Steam tumble drier plus a sink with hot and cold water, leading to the double garage. Entertainment for everyone, we have installed for your pleasure 6 cable television sets One High Definition 46" Flat screen TVs, and additional DVD, Sony playstation 3 with BluRay player and HI-FI. Can sleep 12 including use of the queen size sofa bed in the sitting room. There is a WC downstairs and outdoor WC and shower by the pool. We really enjoyed staying in this very well maintained, convenient and private villa. The villa is in a great location and convenient for all activities. We loved spending time by the pool with the lake view. It is private with the sun on the patio all day long. The owner's have made it a very relaxed and comfortable villa. A well presented and fully featured villa in which we had 3 weeks of relaxation. The location and outlook totally met our expectations with a great south facing pool overlooking a lake that kept us occupied watching the variety of wildlife around it. One of the best features was the two large master bedroom suites. We wholeheartedly recommend Rogers villa as a wonderful place to relax or a base to explore Olando's many attractions. We had the most enjoyable two week stay at Rogers villa. We couldn't have asked for anything more. From its quiet surroundings overlooking the lake (where we saw alligators) to its convenient position close to all the major theme parks and attractions, the villa ticked every box. The heated pool was great for unwinding after a long day at Universal Studios and the free wifi was great for keeping in touch with home. We could not fault the villa and would recommend it to anyone planning a trip to Florida. Simply 10/10! Villa was gorgeous. We have stayed in Florida villas for nearly twenty years and loved this one. Superb location and wonderful to have a south facing outside area. We didn't want to leave. We had a fantastic time staying in Roger's villa. Roger offered great rates and made everything so easy. The villa is great, plenty of room even for 2 families of 4, but just as great for us a family of 4 once our Friend's had returned home. The villa is very private and not over looked great lakeside south facing view just what you need after along day at the parks to be able to chill out and relax. The villa is very well equipped and is a home from home. Our children loved the 2 themed bedrooms, the pink princess bedroom was a great hit with the little girls in our party, and all the kids love the fact that they had their own TV's, DVD players and bathrooms as well as the parents. It was great to have an outside toilet in the pool area no worry's of wet children slipping over on a wet floor going through the house.We recommend this villa 100 percent and hope to return very soon. 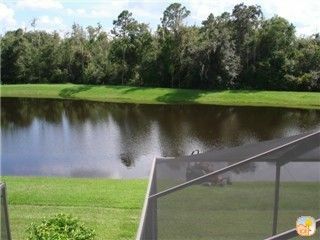 Our 5 bedroom, two storey house has a Prime, South Facing Position overlooking a lake and scenic conservation area in the exclusive, gated community of Cumbrian Lakes in centrally located Kissimmee in the heart of Florida. Seldom is it possible to experience such peaceful surroundings when relaxing on the sun drenched patio by the pool and spa. Disney World is only 10 minutes away, and the home provides a perfect base for your holiday activities, for whichever of the many and varied attractions you decide to visit. The beautiful Gulf Coast, with its golden sandy beaches is only 90 minutes drive and the East Coast is a mere one hour away. The house is conveniently situated just off the 192 and is within minutes of a vast array of wonderful stores, shopping malls, restaurants, and so much more. There is a local hospital close by and medical facilities for minor ailments,. This property has no specific changeover days, so we can tailor your requirements depending on flights etc. Depending on circumstances dates can be flexible and applicable rates negotiable. Please enquire and I will respond as soon as possible.